When I was a kid, my Dad thought I ought to add goat tying to my rodeo resume’. I didn’t want to, so I did anyway. My practice goat was brought up from west Texas and was the wildest little Angora wether that ever lived. I tied him quite a bit, but his growing horns made that a challenge. He got very good at using them and that was hard on jeans and hide. I finally quit goat tying and Joe Goat lived on the ranch. He got pretty big, as wether goats will, and had a keen set of long, curved horns. He lived with the cows. Not the yearlings or calves, or the sheep, but the cows. Nowhere else. He could handle any cow or bull that he met and put many a bull in his place in the pecking order. In a nutshell, Joe was tough. Being Angora, he had a heavy hair fleece that had to be sheared every year. So, at sheep shearing time Joe would have to be caught and relieved of his coat of hair, burrs and whatever else he’d picked up in a year’s time. That fleece was heavy, but, it didn’t slow Joe down in the least. 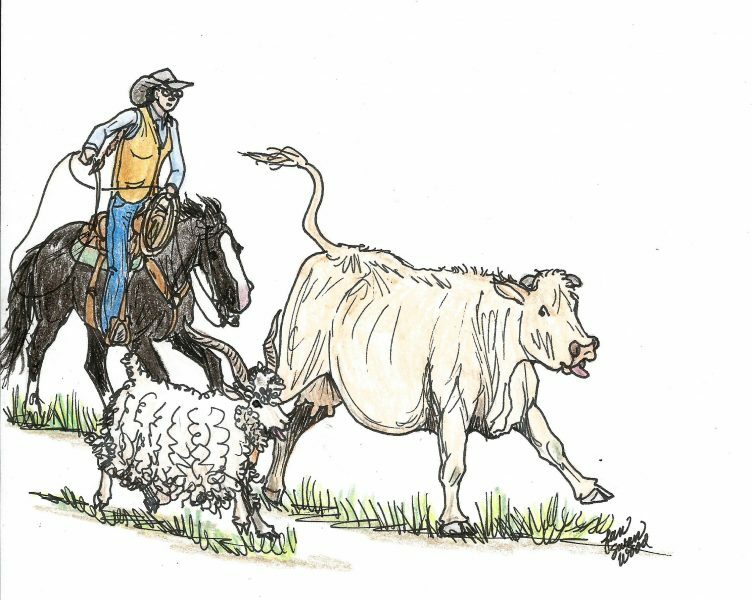 Catching him was the most challenging roping one would do the whole year as he was quick and wily and could duck out of a loop so fast it would make your head spin. Joe was on the ranch long after I had grown up and gone, but I’d go home to help the folks shear every year and I’d have to go out in the pasture and rope Joe. Even as he got older he was still fast and hard to catch. One May I was there to help shear and I had set out to rope Joe. I was riding a really good horse that could track and follow anything, so I was set. I had seen the cows and their April calves out on a big flat south of the creek. I had done a sneak down into the creek bottom and slipped along to the base of the big flat. It was a really steep climb up to where I could see the cows, but Kelly and I made it to the top and kind of laid our eyeballs up over the edge and peered through the grass to locate Joe. Kelly knew we were on the hunt as I had my rope down and a loop built. I finally spotted Joe, grazing alongside a really big Charolais cross cow. That cow was one that Dad had bought and she was a tank, weighing in at 1600 pounds or more. Joe was grazing along, unaware that we were anywhere around. Kelly and I got all set and when we came up over that hill, we were full throttle in a few strides. The cow and goat broke to run together and were hauling their freight across that flat. Kelly rolled up on them and I swung my loop. I can remember clearly Kelly turning one eye toward me as if to ask “are we really going to rope this hippo of a cow?”! Just then Joe ducked off and I turned Kelly after to him. That was a more manageable target, and I swear I felt Kelly’s sigh of relief. Kelly stuck to him like glue and I got him roped. One never had to worry about the rope coming tight once Joe knew he was caught and he promptly trotted over to me and stood by Kelly while I coiled my rope. The cows had grabbed their calves and left the scene after such a rude surprise. A glow of victory was over me as we led Joe back to the corrals. Kelly would have handled that big cow fine, but he sure wasn’t minding the softer job of leading a goat. I was feeling like Roy Cooper (who was THE roper at that time) for catching old Joe with the first loop.